Protect your rights and maximize your payout after a Florida car accident. We answer key questions and show you how to build a strong insurance claim. 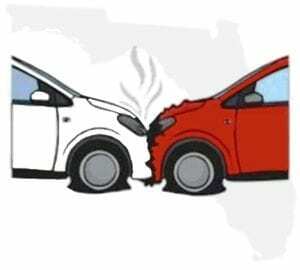 The State of Florida has its fair share of car accidents, with upwards of 374,000 car accidents on Florida roadways in a single year.³ That’s over 1,000 car accidents each day! Car accidents occur when you least expect it. In the aftermath you’ll likely have to deal with legal issues, police reports, insurance companies, car repairs, medical bills, attorneys and more. You’ll want to be compensated for your losses. Knowing what to say and do after a car accident will help you build a powerful property damage and personal injury claim. We’ve outlined 10 steps to help you build a successful auto insurance claim. We’ve also provided answers to the most frequently asked questions that come up after a car accident in Florida. Will the police respond to the accident scene? Which law enforcement agency will be dispatched to the accident? What information needs to be exchanged if I’m in an accident? What if the accident resulted in injuries? What if I’m injured in an accident? What if I crashed into a parked car and no one was in it? Can I be held liable for helping someone injured in a car accident? Do I have to file a crash report if police come to the accident scene? Can I complete and file the crash report online? 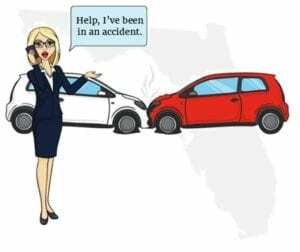 How can I obtain copies of a Florida car accident report? What’s the role of law enforcement at an accident scene? Do the police officers have to listen to my side of the story? Why is it important to gather evidence from the car accident scene? What kind of damages are covered by insurance? What additional information will support my auto insurance claim? Are photographs and video important for my insurance claim? Are witness statements important for my insurance claim? Who’s covered under no-fault injury insurance? Do I always have to file a claim with my own insurance company? Am I required to carry additional insurance? Do I have to use my own insurance for damage to my car? What does the “Cooperation Clause” mean for me? Do I have to report the accident to my insurance company if no one was injured? Do I have to report the accident to my insurance company if it wasn’t my fault? When do I contact the at-fault driver’s insurance company? Can I just settle with the other driver without involving the insurance company? Are there apps to help file accident claims? 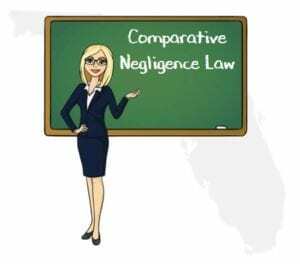 How does Florida Comparative Negligence work? 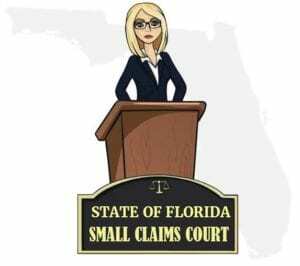 What amount can I sue for in Florida Small Claims Court? When would I consider small claims court? Where can I find out more about filing a small claims lawsuit? What should I do if the statute of limitations is about to expire? What should I do if the insurance company won’t return my calls? You’ve just been in an accident. The first thing you must do is stop at the scene, or as close as possible. Stay calm, remain focused, and keep your wits about you. Check for injuries and call 911. The 911 operator needs specific information to determine the location of the accident, if there are injuries, and whether the police, paramedics, and tow trucks are needed. Avoid giving your explanation of who was at fault. The 911 operator doesn’t need your opinion of who caused the accident and why. Location: Give specific details about your exact location. Look for street signs, intersecting roads, highway mile markers, and landmarks. Giving the operator a specific location will assure the police and paramedics can arrive as quickly. Describe the Scene: Let the 911 operator know what the crash scene looks like, specifically if there are any hazards like downed power lines, leaking fuel, or overturned vehicles. Injuries: Tell the 911 operator if anyone is injured, complaining of pain, or asking for help. In most cases police, paramedics, and tow trucks will be dispatched to the scene when there are injuries or if the accident is blocking traffic. In busy jurisdictions, when the accident is reported as a fender-bender with no injuries, police will may not be dispatched to the scene. If the accident occurs within a municipality, local police department will be dispatched to the scene. If the crash occurs outside city limits, the county sheriff’s department will be dispatched. If the crash occurs on a State Highway, Florida Highway Patrol will be dispatched. * Note: In some cases there will be overlapping jurisdiction. This means one or more of the above law enforcement agencies may be dispatched to the same accident. If you’ve been involved in a Florida car accident involving injuries or property damage, you’ll need to share your name, address, and vehicle registration information. You must also show your driver’s license to anyone involved in the crash as well as the responding police officer. Florida law requires drivers to offer “reasonable assistance” to anyone who is injured in an accident. Reasonable assistance includes driving or making transportation arrangements to get the injured person to a hospital for medical treatment. Your injuries may be obvious, but oftentimes they’re not. Depending upon the severity of the crash, adrenaline can run through your body, masking symptoms of injuries. Because of this, it’s very important to seek immediate medical attention after an accident. If the paramedics are dispatched to the scene, let them decide if your injuries are serious enough to require transporting you for medical treatment. *Note: Failing to seek immediate medical treatment after an accident may undermine your insurance claim. The insurance company will jump at the chance to say your injuries weren’t caused by the collision and deny any claim you may have. If you crashed into a parked and unattended car, stop immediately and try to locate the owner. Once located, explain what happened and give them your name, address, and the registration number of the car you were driving. If you’re unable to locate the owner, leave a note explaining what happened. Be sure to include your name, phone number and address. Leave the note in a conspicuous place on the damaged car. You’re also required to report the accident without delay to local police. No. Under Florida’s “Good Samaritan Act”, if you stop to help someone who appears to be injured or someone who asks for help, you are immune from civil liability. 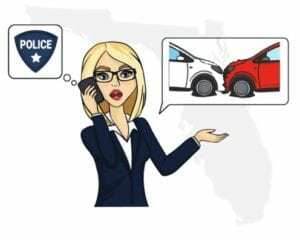 If you’ve been involved in a Florida car accident with injuries to any person or damage worth $500 or more, you must immediately report the accident to the local police department by the quickest means possible. Calling 911 will satisfy the immediate notification requirement. Not if the officer dispatched to the scene files a crash report. If the accident was a hit and run, or involved injuries or death, a drunk driver, or property damage over $500 and the investigating officer did not file a report, the driver is required to submit a crash report form to the Florida Highway Patrol within 10 days. Yes. To fulfill the crash reporting requirements online, visit the Florida Highway Safety and Motor Vehicles website. The self-reported traffic crash application will guide you through the steps by asking a series of questions. To obtain a copy of a crash report filed in the State of Florida, go to the Florida Highway Patrol Traffic Crash Report website. Traffic crash reports are exempt from public disclosure for 60 days after the date the report is filed, except for parties involved in the crash. Law enforcement officers are highly trained in accident scene investigation. When officers are dispatched to an accident scene they are focused on fulfilling their duties. It’s important for you to fully cooperate with them at all times. No. While you can try to tell the officer your side of the story, they are not obligated to discuss the accident or its contributing factors with you. It depends. If the officers ask you to identify yourself, including your full name and address, proof of registration, and proof of insurance, you must comply. However, if you’re being questioned about possession of drugs, or for any other action which might result in criminal charges, you have the right not to answer those questions. If a police officer decides you violated Florida traffic laws, you may be issued a traffic citation. 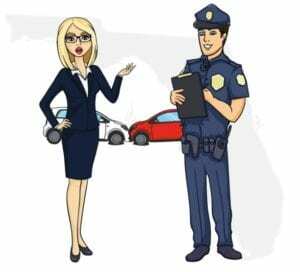 You can attempt to dissuade the officer from giving you a ticket, but if the officer does issue the citation you must accept it, and if requested, sign it. It’s important to know signing the citation is not an admission of guilt. Rather, your signature is only an agreement you will appear in court to face the charge. At that time you may enter a plea of not guilty and contest the citation. If you’ve been injured or had damage to your car, you’ll need evidence to support your demand for compensation from the at-fault driver or the at-fault driver’s insurance company. The minutes following a car accident can be crucial. Before long, cars will be driven or towed away, and the other driver, passengers and witnesses will be gone. Because the accident scene is fluid, it’s important not to waste any time. The evidence you gather will help show that the at-fault driver did something wrong, or failed to act responsibly. This evidence will be used to prove that as a direct result of the other driver’s negligence, you sustained damages. Damages are unique to every accident and to each person involved in the accident. Damages can include car repair bills, rental cars, and the cost to repair or replace damaged personal property. Out-of-pocket expenses for medications, medical devices, travel to treatament, etc. Note: The VIN number can normally be found on the car’s dashboard in the left corner where it meets the windshield. It can also be found on the driver’s insurance card, or on the driver’s side door jamb. Note: If the driver isn’t the owner of the car, you’ll need to get the owner’s name and contact information as well. Yes. Photographs and videos are important evidence that will support your property or injury claim. Use your digital camera, cell phone, or other recording device to take multiple photos and videos of the crash scene. Be sure to include sound. Photographs can identify the position of the cars immediately after the collision, weather conditions, potholes, road obstructions, traffic and street signs, and more. Images and video can reveal the demeanor of the other people involved in the accident. Sound is important because it can capture admissions of fault, intoxication, statements about insurance, and other important factors that may have caused the collision. By taking photographs and video, you make it difficult for anyone involved in the accident to later change their story or dispute what they said or did. Yes. A witness does not have to remain at the scene, speak with you, or give you a written statement. However, a cooperative witness can be very helpful in constructing your claim. Legal formalities aren’t required for witness statements. If you have a witness willing to speak with you, get their full name and contact information. Ask the witness to write down what they saw and heard. If they believe the other driver was at fault, make sure they include that information and an explanation of why. The witness should sign and date each page of their written statement. Make it easy with our free Car Accident Information Form. Keep copies in your car along with a pen, in the same place you keep your insurance and registration cards. You’ll always be ready to gather the evidence you’ll need for a successful insurance claim. 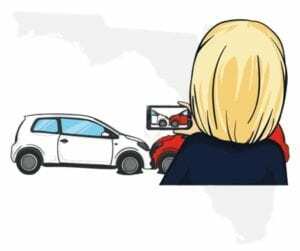 The State of Florida is a no-fault insurance state. In no-fault states, drivers are required to carry auto insurance known as Personal Injury Protection (PIP). Under Florida’s no-fault insurance system, if you’re in a car accident and sustain injuries, you’re required to turn to your own insurance company for compensation. This is commonly referred to as filing a first-party claim. PIP will cover your medical bills, out-of-pocket expenses, and lost wages. However, Florida’s no-fault system prevents you from recovering compensation for pain and suffering, sometimes referred to as emotional distress or mental anguish. Your policy’s PIP coverage provides personal injury protection to you as the driver, relatives residing in your home, others you permit to drive your car, and passengers in the car at the time of an accident. Yes. Florida auto insurance policies must provide a minimum of $10,000 in liability coverage for property damage. 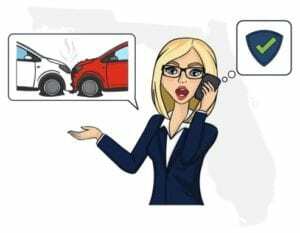 If you have been in a crash or convicted of certain offenses, the Florida Department of Motor Vehicles (DMV) can request you purchase additional auto insurance coverage such as bodily injury liability coverage. An insurance policy is a binding legal contract between you (the insured) and your insurance company (the insurer). Your policy obligates the insurance company to provide coverage for you up to the limits of your policy and defend you after an accident. This includes providing legal representation in the event you are sued. In return, you’re obligated to promptly report the accident to them, even if you believe you were not to blame for the accident. You are also required to cooperate with the insurance company’s investigation of the accident. What does the cooperation clause mean for me? Insurance companies have proprietary language written into their policies. The policy requires you to cooperate with your own insurance company in the investigation of the accident. Failing to cooperate in their investigation may result in your policy not being renewed, a rise in your premiums, or in some cases, cancellation of your policy. Threshold Injury Exception: The injury sustained by the other driver or their passengers may fall under the category of a threshold injury exception to the no-fault requirement. Violation of the Cooperation Clause: You have a contractual duty to report the accident to your insurance company. By failing to do so, you’re in violation of the terms of the policy. Delayed Symptoms: At the time of the accident the other driver or passengers may have said they were uninjured. However, because the onset of symptoms can take hours or sometimes even days to appear, their injuries may not be realized until much later. No Insurance: The other driver may have been uninsured or under-insured at the time of the accident and didn’t want you to know. Fraud: Unfortunately, there are some people who purposely involve themselves in accidents to “cash-in” by filing fraudulent personal injury claims. Your insurance company needs time to investigate the accident in an effort to eliminate those fraudulent claims and protect themselves and you. Yes. By failing to report the accident to your insurance company, you may give the other driver or their attorney an advantage. This often happens when both drivers leave the scene of an accident, both feeling sure nobody was injured. But beware! Because symptoms of injuries may not appear for hours or sometimes even days after an accident, it’s possible the other driver was injured and didn’t know it until later. If that occurs, they may decide the accident was your fault and choose to retain an attorney to pursue an injury claim against you. If you failed to promptly report the accident, your insurance company will be at a disadvantage when you suddenly receive a letter from the other driver’s attorney threatening to sue you. Ana was on her way to work one morning, heading north on Interstate 95 toward Daytona Beach. She intended to take exit 92 West 12. To do so, Ana pulled into the right-and turn lane. She waited patiently for traffic to clear so she could safely exit the highway. As Ana was getting ready to move onto the exit ramp, Phil entered the lane behind her. Thinking Ana was going to complete her exit, Phil moved ahead. What he didn’t realize was that Ana had slowed to let another driver pass. As Ana slowed to let the other car pass, Phil collided with the rear of her car. They both pulled over to the side of the road to examine the damage. Phil asked Ana if she was hurt and she said she felt fine. Ana and Phil exchanged insurance and contact information. Because the accident appeared minor, with no damage to either car and no apparent injuries to either driver, both drivers left. Unfortunately, Phil chose not to report the accident to his insurance company. He didn’t want his insurance company to know he received a traffic citation and was afraid his premiums would rise. The next morning Ana could barely get out of bed. Her back was sore and she couldn’t move her neck without feeling pain and discomfort. Her husband drove her to the local hospital’s emergency room. The physician scheduled Ana for an MRI and CT Scan. Ana was subsequently diagnosed as having sustained a whiplash injury and disk herniation to the L4 level of her spine. Ana was told she would require back surgery, and it would likely result in a permanent injury requiring ongoing therapy and medical intervention. Several days later Ana retained a personal injury attorney. Two months later Phil opened his mail to find a letter from Ana’s attorney informing him that Ana sustained serious injuries in the accident, and that he was responsible for paying those bills and other related damages. By failing to promptly report the accident to his insurance company, Phil not only violated the terms of the cooperation clause, but he also gave Ana’s attorney a substantial head start on the claim. By the time Phil received the letter from Ana’s attorney, she had already located witnesses to the accident, secured copies of her medical records and bills, a medical narrative from her physician confirming her injuries were a direct result of the accident, and more. If Phil had simply complied with the terms of his policy and contacted his insurance company right after the accident, he might not be in this position. They would have already opened an investigation into the claim two months ago. Now he had to wait to see if his insurance company would defend him in the lawsuit and worry about them raising his premiums or cancelling his policy. After notifying your own insurance company, contact the at-fault driver’s insurance company to report the accident. Make sure you have the driver’s name and contact information, the registration number of the car, and the driver’s insurance policy number. Most insurance companies normally have two adjusters working the same accident. One will handle the property damage part of the claim and the other will work on the personal injury aspect. Be sure to obtain both claim numbers. You’ll need them for future communications with the insurance company. No. Never admit fault at the accident scene, or make any “side agreements” for payment. Notwithstanding the contractual obligations in your insurance policy, there is a very practical reason to promptly report the accident to your insurance company. There may be several factors that led to the crash that you don’t yet know about. Also, if the other driver decides to blame you, or anyone from the other car decides to retain an attorney, it won’t be long before they contact your insurance company to demand money. If you failed to report the accident to your insurance company, they would have no knowledge of the accident, forcing them to scramble to protect you. Pure comparative negligence generally applies when an accident results in exceptions to no-fault requirements. Comparative negligence refers to comparing the negligence of each driver in a car accident and then distributing compensation according to each driver’s percentage of fault. Under this law, the victim in a Florida car accident can still seek compensation from a negligent driver even if they shared some responsibility for causing the accident. Pure comparative negligence applies whether the victim was 1% or 99% at fault for the accident. The amount of compensation the victim receives will be diminished by the percentage of their own negligence. Alfie was driving westbound in the right lane on the Ronald Reagan Turnpike heading into Florida City. Mark was also in the right lane, driving right behind Alfie. Alfie was driving below the posted speed limit, and Mark wanted to pass her. He slowly moved into the left lane and increased his speed. Once he believed he was sufficiently past Alfie, he began to enter the right lane in front of her. As Mark moved back into the right lane, his car collided with the front of Alfie’s car. They both pulled over to the side of the road. While Mark wasn’t hurt, Alfie’s left wrist was severely fractured in the crash, requiring extensive treatment and surgery. Her injury was permanent. Mark told police he thought he had safely passed Alfie before moving back into the right lane. Witnesses told the police they saw Alfie speed up as Mark was moving back into the right lane. However, based on the witness’s statements, the investigating officer determined Alfie increased her speed as Mark was attempting to re-enter the right lane, thereby contributing to the crash. Alfie hired a personal injury attorney to help her navigate Florida’s permanent injury exception to the no-fault law, seeking $100,000 in compensation for her permanent injuries, pain and suffering. Mark’s insurance company refused to settle. Through her attorney, Alfie sued Mark for $100,000. The case went to trial. After listening to both drivers, two witnesses, and the investigating officer, the jury determined both drivers were at fault. Relying on Florida’s comparative negligence law, the jury apportioned Mark’s negligence at 75% and Alfie’s at 25%. The jury awarded Alfie $75,000, representing Mark’s 75% comparative negligence, and her own 25%. Under Florida’s Pure Comparative Fault law, even if the jury had determined Alfie was 99% at fault, she would have still been able to recover $1,000 (1%) of her $100,000 claim amount. There are some personal injury claims which can adequately be handled without legal representation. However, there are others which should always involve an experienced attorney. Soft tissue injuries include strains, minor bruising, abrasions or cuts not requiring stitches, first degree burns, whiplash, and other relatively minor injuries. Soft tissue injuries generally don’t result in substantial medical or therapy bills, nor do they involve complex issues of law. Because of this, a victim can usually negotiate a fair settlement with the insurance company without legal representation. Moreover, in soft tissue injuries there may not be enough compensation to pay an attorney, your medical bills, and still leave you with something for your pain and suffering. Hard injuries are much more serious. They can include head trauma, fractures, third degree burns, deep gashes requiring stitches, and other injuries requiring extensive medical care. Compensation for a serious injury claim can be substantial. In these cases you simply won’t be as effective as a personal injury attorney. 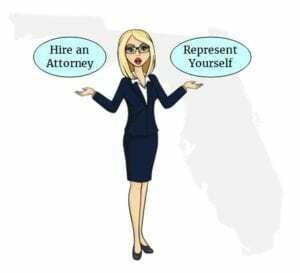 By representing yourself you will likely end up settling for an amount much lower than what an attorney could have secured for you, even after attorney’s fees are deducted. Insurance companies are well aware of the fact that you can only get so far without an attorney. The insurance claims adjuster may lead you to believe you’re an expert negotiator. The reality is, that’s just not true. And once the adjuster makes their final offer, that’s it. From there you have absolutely no leverage. It’s basically take it or leave it. When it comes to hard injury claims, an experienced personal injury attorney will have a plethora of legal tools to rely on to secure the highest settlement possible. And that amount is almost always much higher than the client could have ever hoped to get on their own. Hard injury claims often require filing a lawsuit. Insurance companies don’t like lawsuits. They know once a suit is filed they will have to pay out substantial amounts in legal fees to defense attorneys. Lawsuits require pretrial discovery, including depositions, interrogatories, subpoenas for production of documents, and more. These are actions only an attorney can effectively perform. Personal injury attorneys also have the power to learn the at-fault driver’s policy limits, whether the driver has a past record of traffic accidents, citations, prior arrests, and other helpful information you would have a very hard time obtaining yourself. Most personal injury attorneys won’t charge for the initial office consultation. Your attorney will likely agree to represent you on a contingency fee basis. This means you do not have to pay any legal fees until the attorney settles your case or wins it at trial. If your attorney is unable to settle your injury claim, or loses the case in trial, you will owe the attorney nothing. Your attorney fees will be paid out of your settlement amount or court verdict. Contingency fees can range from 25% to 40% depending on the time involved, the complexity of the case, and whether or not the case goes to trial. Seek out several personal injury attorneys in your area. Most have extensive websites illustrating the types of cases they accept and the success they’ve had. When meeting with an attorney, bring copies of your medical records and bills, a copy of the accident report, photographs, witness statements and other documents related to the accident. After reviewing your paperwork and hearing your side of the story, the attorney will discuss the value of your claim, how long it may take to settle, and if a lawsuit may be necessary. When you’ve had no success settling your claim, you may consider filing a lawsuit in one of Florida’s Small Claims Courts. These courts are designed to give people a forum to have their cases heard before a judge. The very nature of small claims courts is to provide a relaxed venue where parties aren’t bound by Florida’s formal Rules of Evidence. What amount can I sue for in small claims court? Florida’s Small Claims Courts have jurisdiction to hear cases worth up to $5,000. 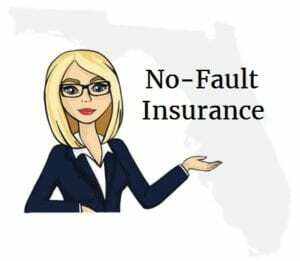 Because Florida’s no-fault insurance system does not require drivers to file first-party property damage claims with their own insurance companies, you can pursue the at-fault driver for property damage compensation. 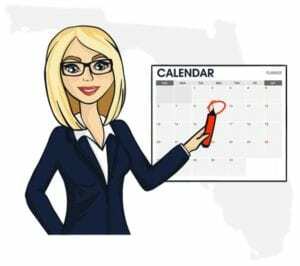 To learn more about filing a lawsuit, and for access to forms such as affidavits, petitions, summons, and more, go to the Florida Bar Consumer Information website. Whether you represent yourself or retain an attorney, Florida’s statute of limitations applies. This is the time period you have to either settle your claim or file a lawsuit. If the statute of limitations period expires and you haven’t settled your claim or filed a lawsuit against the at-fault driver, you lose your right to further pursue any compensation from the at-fault driver or the driver’s insurance company. The Statute of Limitations for car accident claims in Florida is four (4) years. In almost all cases, the statute of limitations period begins on the date of the accident. If the statute of limitations is about to expire and you haven’t settled your injury claim, you must file a lawsuit, even if you file one in small claims court. Filing a lawsuit in any court extends (or “tolls”) the statute. Insurance companies and the claim adjusters who work for them have no legal obligation to settle your claim before the statute of limitations runs out. Be sure to enter the statute of limitations date into your cell phone calendar, on your refrigerator, and anywhere else to remind you of when the date is approaching. Don’t wait until the deadline is looming to protect your right to compensation. Remember, it won’t cost you anything to consult an attorney about your personal injury case.